Video clip synopsis – Possibly our best loved Prime Minister, and a former train driver, Ben Chifley was rarely seen without his pipe, as he guided the country through the austere post-war years. Broadband MP4 chifley_bb.mp4 (19.0MB), suitable for iPods and computer downloads. 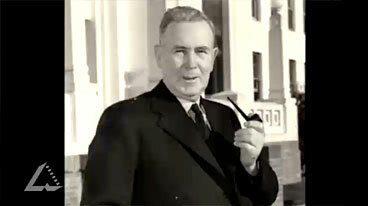 Ben Chifley’s Pipe is an episode from the series The Prime Ministers’ National Treasures, produced in 2007. Award winning cartoonist and yarn spinner, Warren Brown, reveals the emotional lives of Australian Prime Ministers through 10 objects they used every day or even adored – from Robert Menzies’ home movie camera, to Joseph Lyons’ love letters, Harold Holt’s briefcase and Ben Chifley’s pipe. These treasures reveal the nation’s leaders, as you have never seen them before. The Prime Ministers’ National Treasures is a Film Australia National Interest Program produced in association with Old Parliament House and the Australian Broadcasting Corporation. Teachers and students should consult their State’s curriculum and learning programs. One of the most highly regarded of Australia’s Prime Ministers, Ben Chifley was a former train driver with a voice like worn out boot leather. He was well aware that his image as the typical bloke next door—he was rarely seen without his tobacco pipe—helped to sell an ambitious raft of post-war reconstruction projects to the Australian public. He was also a gifted treasurer, prone to personal and professional thrift, which allowed him to set the stage for Australia’s economic boom in the 1950s. Chifley became Prime Minister after the death of John Curtin. The war ended soon after, and the great challenge was now changing to a peacetime economy that would create jobs for the returning troops, house the new families they would start, stimulate trade and development, and increase social welfare. The economy was so active that not only were houses built and jobs found for the 10,000 men who were returning each week, but a massive immigration program was started. Many of the migrants worked on the new Snowy Mountains Hydro-Electricity scheme, with its promise of opening up new areas to irrigated agriculture. One of the Chifley Government’s main challenges was the threat that inflation would soar in such an economic boom time, as demand outstripped supply. Chifley countered this by maintaining some of the price controls and rationing that had been imposed during the war. He also wanted to give the Commonwealth more power to control the economy, and proposed to do this by taking over the banking system. His attempt to change the Constitution to allow this was defeated in a referendum. Mistrust over Chifley’s economic policies, plus resentment at continued rationing and controls, led to his defeat in the 1949 election. Ben Chifley (1885-1951) was Prime Minister of Australia from July 1945 to December 1949. Ben Chifley’s pipe is held at the Ben Chifley Home in Bathurst NSW. History sometimes involves the study of artifacts — often in a museum, as part of a site study. Objects and artifacts can tell you about a person or a time — but only if you can ‘interrogate’ them to find out what their story is. Here are questions that you can use on museum objects, such as this one about the Prime Minister, to help reveal the meaning and significance of objects. What does it show? — People? Symbols? Words? If so, who or what are they? What might it tell us about attitudes and values — that is, those things that people believe are the right way to behave? What does it tell us about how people behaved at the time? Chifley’s pipe was a characteristic feature of him. Look at almost any cartoon, and many photographs, and you will probably see Chifley holding or smoking a pipe. The images we see are visual representations of a person. These can be made to be realistic/neutral, positive or negative. Look at the way cartoonist Warren Brown has caricatured this Prime Minister. Is it neutral, positive or negative? Other cartoons that you may find at the National Library of Australia. Then see if you can create a representation — neutral, positive or negative — of some aspect of the Prime Minister that you have discovered.